This articles mainly introduces how to upload iTunes M4V videos to Facebook by removing iTunes DRM protection and converting iTunes M4V to MP4 format with M4VGear DRM Media Converter. Apple Inc. still not create an iTunes version for Linux. If you need to play iTunes rented or purchased movies on Linux (Ubuntu), you can choose to remove DRM from iTunes videos in order to play iTunes movies on Linux freely. iTunes movies and TV shows are protected by Apple’ FairPlay, which means you're not allowed to import your iTunes rentals and purchases to FCPX. Here we'll guide you to add iTunes videos to FCPX for editing. In general, YouTube supports most common video formats except M4V. When it comes to uploading iTunes M4V video to YouTube, you can use M4VGear DRM Media Converter to convert M4V to MP4, a common format supported by YouTube. M4VGear iTunes to RealPlayer Converter makes it possible to play iTunes videos on RealPlayer. This article describes how to easily convert DRM-Protected iTunes videos to DRM-Free MP4 videos for playback on RealPlayer. 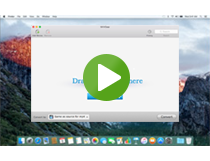 Want to burn iTunes videos to DVD so that you can enjoy them on TV through DVD Player? Let M4VGear unlock the DRM from iTunes videos for you to burn them to DVD. The article introduces how to sync and backup iTunes DRM proteced videos to Google Drive with the help of the best DRM removal tool - M4VGear DRM Media Converter. VLC Media Player is not able to directly play iTunes videos on Mac. M4VGear helps you remove DRM and convert iTunes M4V to unprotected MP4 videos for playing on VLC. Windows Media Player can also play iTunes videos as long as you remove DRM from iTunea videos and convert them to Windows Media Player supported video formats like WMV or audio formats like MP3.